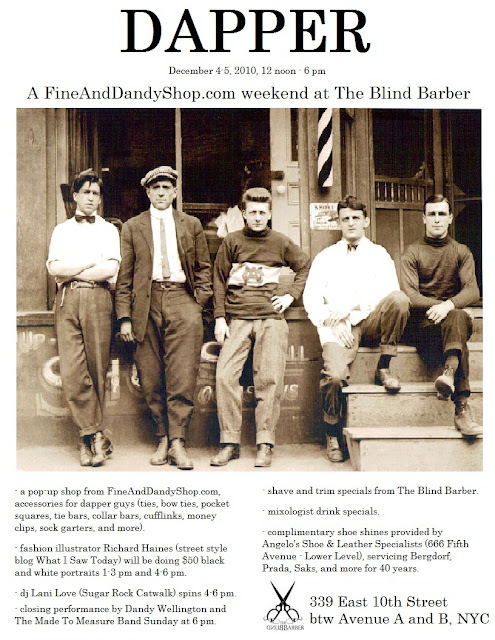 The guys at FineandDandyShop.com are opening as pop up shop with our good friends at Blind Barber so of course that weekend is going to Dapper. To top off all the Dapper wears Dandy Wellington and The Made to Measure Band will be on hand to provide best in Dapper entertainment. 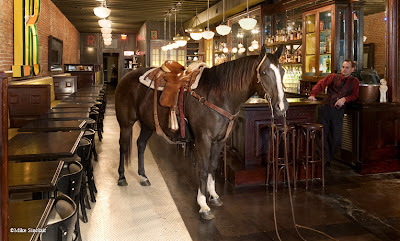 On the hit list to visit in 2011: The Varnish in LA, PS7 in DC, Glasgow for drinks with Mal Spence, Eastern Standard in Boston, Tales of the Cocktail Part Trois, The Manhattan Cocktail Classic, and so much more. Please join us on December 2nd for Hawaiian Holiday cocktails at Lani Kai in New York. It is also Loungerati's fourth birthday. 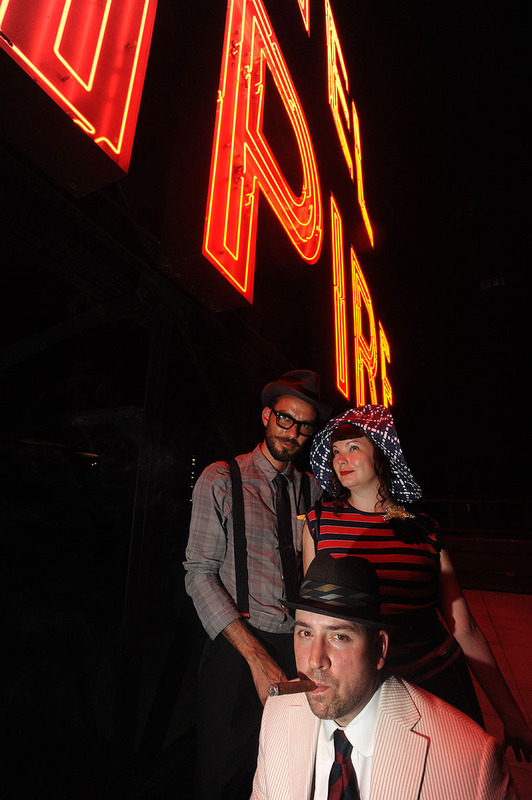 This year we are adding a spotlight on the lounge/bar scene in an up and coming city that is not New York. Kansas City has a rich history of jazz music and lounging dating back a hundred years. This year's Greater Kansas City Bartending Competition (GKCBC) brought this former cocktail heavyweight back into the light. In addition, it is home to The Senator, a founding member of Loungerati and our man between coasts. Senator is a newspaper publisher, a former big band crooner, a Terapin pigskin pugilist, ex-tavern/restaurant manager, and pillar of the lounge community. He is also the former Mayor of Carmine Street in New York’s Greenwich Village and regular at Daddy-O - which lends Mickey Rourke circa 1983 gravitas to his Lounge credentials. Café Cedar is Parkville's version of the Bermuda Triangle, only way weirder — basically an old printer's shed retrofitted into a faux riverboat. The décor consists mostly of items hoarded by the building's landlord in an aborted attempt to create a museum seasoned with various tsotchkes from around the Middle East. The menu is all over the map, offering everything from fried chicken to falafel; the staff is just as diverse, populated by Park University women's soccer players from Hungary, Australia and a few places in between. The owners — an affable Jordanian man and a pretty Mexican woman — work seven days a week to tend to their regulars, a colorful cast that includes eccentric townies, curmudgeonly old-timers, transplanted East Coasters, recent retirees, hot hairdressers, African exchange students, military men from Leavenworth, lawyers, local politicians, musicians, struggling artists and millionaires. And while most bars consider the topics of politics and religion off-limits, they are de rigueur here, turning the three-sided bar into a local stand-in for the chamber of the U.N. General Assembly. Luckily, it's also the type of place where the night almost always ends with just one more round, a big group hug and an order of hummus to go. "Printed without permission from The Pitch Weekly". Legend has it that President Harry Truman and wife Bess had a particular dislike for Washington D.C. For one, everyone seemed a lot more pretentious and stuck up than the "common folk" they knew back in Independence, Missouri and when it came to cocktail hour, the White House bar staff failed to show the Show Me state's first couple anything worth writing the fam back at home about. Too polite to complain outright, the Trumans kept a tight lip, mustered a smile and said the drink was "fine" whenever asked about their old fashioned cocktails. After a while, however, the guy who dropped the big one and fired MacArthur was unable to remain tight lipped much longer and complained about the "weak" drinks. Out of ideas, the White House staff decided to dispense with the bar fruit and sugar and just poured two glasses of straight bourbon over ice and handed them over to Harry and Bess. Finally, Bess said, they had a real cocktail in their hands. R-Bar in Kansas City's iconic (re: abandoned and kinda creepy) West Bottoms district dispenses with the fruit, but keeps the bitters...in a way that would have made the Truman's very happy indeed. "Sam", the striker for Park University's women's soccer team, hails from Australia. Cuter than sin by any international standard and with a dry, knowing wit that translates into any language, she really isn't the best mixologist in the city but then she's the first one to admit that accent is everything. Jazz Kitchen is one of the city's best bars, no doubt, but Sean had been there for seven years and it really wasn't his type of bar if you asked me. I mean, the guy was wearing a vest and had a watch fob in a place that encouraged people to write on the walls and bar with black markers. So after a few scouting missions, we put together a package lucrative enough to lure him away and he carved out his niche at the far end of the bar at City Tavern. 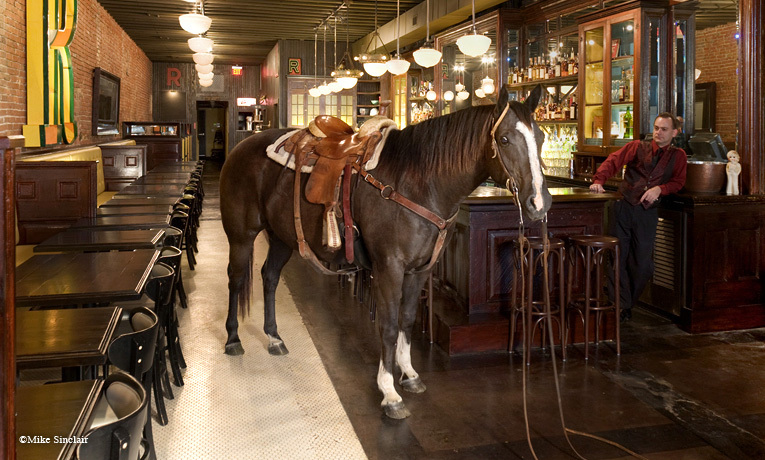 He's a true saloonkeeper in the wipe-the-bar-top-off-with-a- towel-after-every-drink-served kind of way. He's the kind of guy, that reads the newspaper or a good book before his shift -- which he always showed up a good half-hour early for -- and lays off the sauce during work hours. Admittedly, he's not a 'volume' bartender...his strength lies in his ability to converse with customers, share stories and dedicate some time and effort into pouring a drink for them. Now, I know a lot about the business of booze in my own right...I mean, I invented the 'Len Dawson' cocktail ("mmmm...tastes just like Len Dawson!") but together he and I collaborated like a gin-fueled Lennon and McCartney...our recipe for the Moscow Mule won the 'Best of' at The Pitch and double handedly returned that drink to the KC scene. He also stood with me in my futile fights with ownership to get rid of the clock behind the bar ("It's like having a picture of 'Mother,'" he quipped when asked by the bar's money men) and was someone you could trust with the keys to the safe. With the possible exception of Fredo, (my vanquished opposition at the now infamous Greenwich Village Martini summit of '98), I never met a guy who knew more about spirits and their history than Sean did. To wit, this classic exchange overheard at the bar between him and an inquisitive Cosmopolitan imbibing lady: "What's 'Triple Sec?'" (beat) "Three times the normal amount of Sec." Joy Jacobs, owner of R-Bar, couldn't have made a better hire. Kansas City, one of the principal cradles of jazz along with New York, New Orleans and Chicago, bred a number of nationally significant big bands and a legion of talented soloists, who revolutionized jazz in America. These musicians belonged to Local No. 627, one of a handful of African-American musicians unions affiliated with the American Federation of Musicians. Established in 1917, Local 627, then known as the “Colored Musicians Union,” operated as a social center, a clearinghouse for engagements, and as a vehicle for grievances against unfair practices by booking agents and bandleaders. 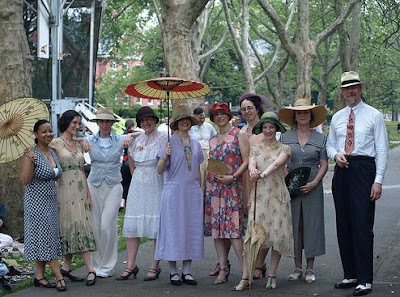 The jazz style pioneered and fostered by the members of Local 627 developed along original lines influenced by, yet unique from, the traditions of New Orleans, Chicago and New York. Today, the tradition jams on at the Mutual Musicians Foundation, located on the former site of Local 627 at 1823 Highland Ave., in the heart of the historic 18th and Vine District. The Mutual Musicians Foundation, Inc., originally incorporated to manage the building and assets of Local 627, continued operating the building as a social club for musicians and fans after the merger with Local 34 in 1970. In 1979, the Foundation was prominently featured in Bruce Ricker’s film, The Last of the Blue Devils. A National Historic Landmark, the building is also entered in the National Register of Historic Places and the Kansas City Landmarks Commission Register. As they have since 1930, musicians gather at the Foundation Friday and Saturday nights after midnight to jam into the early morning hours. For the past two years, KC's KCUR 89.3 FM has broadcast "12 O'clock Jump" -- a weekly one hour jazz, blues and comedy variety show, broadcast every Saturday at midnight which celebrates Kansas City’s jazz heritage and the after-hours jams that have made the Mutual Musicians Foundation the late-night place to be since the 30s. A multi-crowned Argentinean beauty queen, Cristina Worden is now more locally famous in the Kansas City area as the muse and inspiration behind "Piropos" and "Piropos Grille" -- the region's only Argentinean steakhouse restaurant chain. Cristina Worden is, quite simply, lounge royalty. The kind of woman whose radiance literally lights up a room when she enters, she is always meticulously made up, dressed like a Hollywood legend and rocks the Chanel #5 in ways that would make Ernest Beaux blush. While others around her -- her husband Gary, for instance -- struggle to keep up with the Spanish phrases muttered on Sesame Street or Dora the Explorer repeats, Cristina regulates dinner or cocktail conversations in Spanish, English, French, Italian and Argentinean dialect with ease. And if you think she'll tap out early with a yawn and wave of her crown-worthy jewelry around midnight -- think again. Cristina doesn't keep up with party-goers -- she sets their bar and as the night progresses, far surpasses them. In Buenos Aires she'd just be getting started by the time Kansas City shutters, but that's OK...she never pushes it or loses control. And if you're one of those lucky enough to rent out a room at the Worden's premium bed and breakfast in Parkville or a lounger who somehow gains entry to her home's next morning Buenos Aires breakfast show, you can simply count yourself among the lounge elite because it really doesn't get any better in polite society than that. Loungerati teams up with our gracious host Julie Reiner at SoHo's newest cocktail destination, Lani Kai, for a Holiday Liquid Luau, and to celebrate four years of Lounging, Life, and Libations. There will be Loungerati drink specials, world class cocktails, a fireplace, and delicious Hawaiian food. Dress your Lounge best and bring the liver too. Please mention "Loungerati" to the hostess to get in. See you there! Please RSVP to loungers at loungerati dot com or on Facebook. In the west of Sicily, just outside the town of Caltanissetta, across the Salso river, and rolling golden hills is the Abbey of Santo Spirito. Like the neighboring town that was first settled in 406 BC, the abbey is rich with history. For centuries the monks treasured a secret formula for their liqueur. In 1854 the friars of the Benedictine Order that operated the abbey, awarded their "patrone" Salvatore Averna the secret recipe for their proprietary elixir - an herbal spirit that would become iconic Averna Amaro. Don Averna, clearly knowing he had a real blessing on his hands, formed the Fratelli Averna in 1868 and began making Averna Amaro. Salvatore's son Francesco, however, is credited for expanding the brand in the early years and began distributing the award winning spirit throughout the continent. Averna became Sicily's first licensed spirit. To this day, the company is still run by the Averna family. Averna is distilled from a blend of flowers, herbs, dried fruits, citrus rinds, and licorice. After the key ingredients are soaked in neutral grain alcohol, then caramel is added. The resulting amaro has a complex but unique taste that is full bodied with a bitter sweet finish. Typically, amari such as Averna were considered digestivi (digestives or after dinner drinks) in Italian culture. However, as the mixology renaissance continues and bartenders expand their palette of base and modifiers, amari are gaining renewed popularity. Damon's instructions: "Shake with large cubes, after 5 seconds, stop, and hand the shaker to the nearest attractive woman, let her shake it for another 10 seconds. Trust me. Strain into a coupe or footed sour glass. Drop 5-6 drops of Bittermen's Xocolatl Mole bitters on top of foam and run a thin straw through them." Damon's commentary on the flavor profile: "The recipe specs are fairly straight ahead. The rum and cognac are spirits that play well together, while the lemon acts simply to separate the Averna's earthy complexity from its caramel sweetness. The egg white, meanwhile, softens any hard edges, and brings the amaro's aromas to the top"
I would add one modification to the above, dry shake the ingredients first and then add ice. Where to get it: Clover Club in Brooklyn or Lani Kai in SoHo when Damon is rolling drinks and preferably on a Tuesday. Best of Lounge 2010 - Voting Begins! Lastly, we will also be featuring an up and coming lounge worthy city that is not New York. This year it will be Kansas City which was legendary for jazz and whiskey joints. Loungerati Editor, The Senator will be rounding up his Best of Lounge from his adopted city.